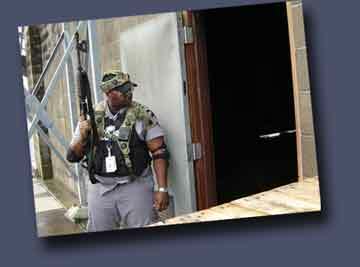 MILES 2000 is a Force on Force Training Simulator that is designed to replicate firing of small arms. The MILES has a laser transmitter that is fitted to the barrel of the firearms and is activated when the player fires a blank round. The noise of the blank round and the vibration of the recoil action triggers a laser beam to be fired from the transmitter. Each player is wearing a harness fitted with 16 laser receiver sensors that detect a hit by the laser beam. The Events Data Recorder fitted on the harness then emits sounds and flashing LEDs to indicate a kill, serious wound or light wound. This activation can be silenced when the player lays on his back or when an umpire/observer controller resets them with the umpire gun. After the event all the data from each player can be collected in the umpire gun and downloaded into a laptop computer which prints out a report detailing how many shots were fired by each player, who shot who and when. This data can be used to measure effectiveness of fire support, or shooters accuracy. – No special safety clothing or masks are available for all players such as used with Simunition?